Welcome to this blog report about my summer beach vacation in Denpasar (Bali), Indonesia in June 2011. This blog report will be divided into a total of four sections. This will be the first segment of the report, where the in-bound journey towards Denpasar (Bali) and the journey to the Sentosa Private Villas & Spa Bali will be the main focus topics of this segment. All the holiday videos posted on this blog report may also be found on my YouTube channel. However, please be aware that for safety reasons, the posting of comments for all uploaded videos on my YouTube account is prohibited, as is the display of advertisements. After spending months and weeks of planning on where to go to for the upcoming mid-term June school vacation during my fourth year in secondary school, we decided upon going on a summer beach vacation to the popular Indonesian resort island of Bali. In light of the ongoing economic effects in Japan following the Great East Japan Tsunami in March, we knew that touching Japan would not be safe at that time. On the morning of Thursday (16 June), all of us woke up at around nine o' clock after having a well-earned good night's sleep. The very first thing we did was to have a nice, hot shower and change into our attire before packing the remainder of our baggage in preparation for the trip. There was no one to assist us in the packing of our baggage, as my housekeeper had to return to the Philippines to attend an important family event. According to my parents, our itinerary for the in-bound segment towards Bali would be to fly with Qatar Airways on flight QR 638 bound for Denpasar (Bali), which would be scheduled to depart Singapore Changi Airport at 4.35 p.m., and arrive at Bali's Ngurah Rai International Airport at 7.05 p.m.. They had also arranged for MaxiCab to come and pick us up at 1.25 p.m. towards Singapore Changi Airport Terminal 3 a few weeks in advance. This summer beach trip to Bali would also mark our first flight with Qatar Airways, which would also be our first Arabian airline we have ever flown on. Once all of our baggage had been sorted out and checked, our pre-arranged MaxiCab finally showed up at our doorstep at 1.15 p.m.. The driver then got out and helped us load all of our baggage into the boot of his cab, as my younger brother and I boarded and waited. Once our entire house was locked up, we finally departed the familiar compound of our home at 1.25 p.m. for a short road journey of 35 minutes towards Singapore Changi Airport Terminal 3. Soon enough, we finally arrived at the departure drop-off area of Singapore Changi Airport Terminal 3 at two o' clock. While the cab driver assisted my dad in unloading our baggage from the cab, the rest of us went to claim a few baggage trolleys. Once all our baggage had been loaded onto the trolleys, we thanked the MaxiCab driver for his services and went into the terminal building towards the Qatar Airways Business Class check-in counter, located at Row No. 5. Terminal 3 is currently the newest passenger terminal operating at Singapore Changi Airport today. It was opened for service on 9 January 2008 in order to cater to the rising foreign tourist arrivals into Singapore. Singapore Airlines re-located all of its long-haul flights bound for the Americas, Far East, Oceania and the European Union from Terminal 2 to Terminal 3, while all other flights bound for the Indian Sub-continent, Middle East, Southeast Asia and Africa remain in Terminal 2. China Eastern Airlines, Jet Airways, Qatar Airways and United Airlines shifted their operations from Terminal 1 to Terminal 3 on 25 March 2008. As time went by, four more airlines, namely Garuda Indonesia, Saudia, SriLankan Airlines and Vietnam Airlines re-located their operations from Terminal 1 to Terminal 3 on 22 February 2011. Kingfisher Airlines initially commenced operations to Singapore using Terminal 3 on 17 September 2009, though it later shifted its operations to Terminal 1. However, Kingfisher Airlines later terminated all of its international operations on 25 March 2012, following the airline's financial crisis. The probability of Kingfisher Airlines making a full recovery seems to be very slim, as of now. After a short five-minute walk from the departure drop-off area of Singapore Changi Airport Terminal 3, we finally arrived at the Qatar Airways Business Class check-in counter at Row No. 5 at 2.05 p.m.. Without wasting anymore time, we entered the Business Class check-in row of the Qatar Airways check-in counter to check in for Qatar Airways flight QR 638 bound for Denpasar (Bali). The entire check-in process took no more than just 10 minutes. Qatar Airways is the flag carrier and largest airline of the State of Qatar in the Middle East. Maintaining its head office in the Qatar Airways Towers in Doha, the state capital of Qatar, the airline offers at least 100 destinations worldwide from its hub at Doha International Airport, using a mixed fleet of narrow-body and wide-body aircraft from Airbus and Boeing, consisting of more than 100 aircraft. The airline was awarded the prestigious Airline of the Year award by SkyTrax in 2011, and is one of the only six airlines in the world to be given five-star rating. A new international airport, Hamad International Airport, is scheduled to open in mid-2014. The airport will eventually replace the older Doha International Airport as the sole airport in the State of Qatar. The new airport will eventually become the new hub for Qatar Airways, allowing the airline to expand itself further. After checking our in for Qatar Airways flight QR 638 bound for Denpasar (Bali), we finally received our boarding passes for the in-bound flight towards Denpasar (Bali), along with our invitation cards to sample the SATS Premier Lounge at 2.15 p.m.. The check-in agent then informed us that Qatar Airways flight QR 638 bound for Denpasar (Bali) would depart at 4.35 p.m. from Gate No. A11, and that boarding would commence at 4.05 p.m., approximately half an hour prior to the scheduled departure timing. With that, we thanked the check-in agent for her services, and proceeded to the passport control area before heading into the airside. To clear the passport control area, we used the thumb fingerprint checkpoint, which is reserved exclusively for Singaporean citizens and permanent residents of Singapore. Arriving at the airside by 2.25 p.m., the very first thing we decided to do would be to proceed to the SATS Premier Lounge to have some beverages and light bites before our short flight to Bali. We then took the escalator up to the upper level of the airside, arriving at the SATS Premier Lounge by 2.30 p.m.. At the lounge reception counter, the lounge receptionist checked our invitation passes before allowing us to enter. Once our invitation passes had been checked, we proceeded into the lounge and had some light bites and beverages prior to the journey towards Denpasar (Bali). At the same time, I did my usual plane-spotting activity to pass the time. After relaxing and having some light bites in the SATS Premier Lounge for approximately 50 minutes, the clock was finally showing 3.20 p.m.. Though boarding for Qatar Airways flight QR 638 bound for Denpasar (Bali) would commence in 45 minutes' time, we decided to do some duty-free shopping before the flight. With that, we packed up all our belongings and left the lounge by 3.25 p.m.. Along the way, we stopped at a nearby duty-free shop, by the name of DFS Galleria. While shopping there, we managed to purchase a large bottle of Bailey's Irish Cream with a flavour of Crème Caramel. Upon purchasing our duty-free items, we resumed our walking journey towards Gate No. A11, where our flight would be departing. The entire walk between the SATS Premier Lounge and Gate No. A11 took no more than 15 minutes. Soon enough, we finally arrived outside the entrance to Gate No. A11 at 3.40 p.m., which was just in good time for boarding to commence in 25 minutes' time. With just a rapid, hassle-free security check, we were finally in the passenger waiting area of Gate No. A11 by 3.45 p.m., approximately 20 minutes before boarding could commence. To my surprise, I met up with my secondary school counsellor, Mr. Reuben John, along with his wife, Mrs. John. Introducing him to my family, Mr. John explained to us that he and Mrs. John were also heading to Bali for important business. Today, Qatar Airways flight QR 638 bound for Denpasar (Bali) would be operated using a Boeing 777-300/ER, registered A7-BAF and powered by two General Electric GE90-115B engines. Like all other Qatar Airways aircraft, the aircraft had a beautiful logo of an antelope on its tail fin. A7-BAF was delivered to Qatar Airways on 29 September 2009 as the seventh Boeing 777-300/ER and the ninth Boeing 777 for the airline. The overall delivery made the aircraft approximately 1.7 years old at that time. The Boeing 777-300/ER is the latest passenger model of the Boeing 777 today. It has the same body as the Boeing 777-300, but has raked and extended wingtips, and is powered by two powerful and exclusive General Electric GE90-115B engines. The first aircraft, F-GSQA, was delivered to Air France on 29 April 2004, with Air France also being the first airline to order this aircraft. The main competitor from Airbus for the Boeing 777-300/ER is the Airbus A340-600, which is powered by a choice of four Rolls-Royce Trent 556-61, Rolls-Royce Trent 556A2-61 or Rolls-Royce Trent 560A2-61 engines. The upcoming Airbus A350-1000 will also compete with the Boeing 777-300/ER, and will be powered by two Rolls-Royce Trent XWB engines. Orders for the Boeing 777-300/ER have been met with high demand from many major airlines due to its modern-day technological improvements, and to replace their older aircraft, such as the Boeing 747-400. For example, Air China, the flag carrier of the People's Republic of China (Mainland China) has a total of 20 Boeing 777-300/ERs on order to replace its older fleet of Boeing 747-400s, with six of them already delivered and in service as of 1 May 2012. While waiting for boarding, I was also greeted with a surprise from a person whom I know in school. The surprise person was my school counsellor, Mr. Reuben John. I then greeted him and told him where I was heading to. Mr. John was also heading to Denpasar with his wife for reasons which I do not know (possibly for a break and some work). They were both flying in Economy Class with Qatar Airways (probably behind us). At 4.05 p.m., the first boarding calls for Qatar Airways flight QR 638 to Denpasar (Bali) were finally made. We, along with all the other Business Class passengers, were allowed to board the plane first, as part of the usual airline boarding routine. We were on board A7-BAF by 4.10 p.m., just in good time for a 4.35 p.m. departure to DPS. The flights attendants then did their usual routine of serving pre-departure beverages to the Business Class passengers. Here are some pictures I took while waiting for departure. At 4.25 p.m., all the aircraft doors were closed, and the safety briefing demonstration video was shown on our screens. We pushed back from Gate No. A11 approximately 10 minutes ahead of schedule, and made our way to our assigned runway. After approximately 25 minutes of taxiing to our assigned runway, the two powerful General Electric GE90-115B engines spooled to life, and we finally took off from Singapore Changi Airport at 4.50 p.m., heading for a regional journey time of 2 hours 10 minutes to the resort island of Bali, Indonesia. Bali is an Indonesian island located in the westernmost end of the Lesser Sunda Islands, lying between Java to the west, and Lombok to the east. The capital of Bali province is Denpasar. It is a popular tourist destination for foreigners going for a beach holiday. However, the island can become increasingly crowded during the summer months (e.g. May to July) due to its popularity with foreigners at this time. The Balinese economy was severely affected when the district of Kuta located in southern Bali suffered two terrorist bombings in October 2002 and October 2005. This resulted in many tourist arrivals dropping, and less tourists visiting the island resort, eventually causing the locals to lose their livelihood. It took several months before the tourists regained enough confidence to return to Bali. The seatbelt sign was turned off at 5.05 p.m., approximately 15 minutes after take-off from Singapore. I then went to use the lavatory, just before the meal service commenced. The flight attendant then came up and asked me what I wanted for the light meal between Singapore and Denpasar (Bali). I then opted to have the tagliatelle with prawns in cream sauce, portobello mushrooms, sautéed red and green peppers for my main course. As soon as my tray table was set up with a white linen cloth, my tagliatelle with prawns in cream sauce, portobello mushrooms, sautéed red and green peppers arrived. The pasta tasted quite alright, nothing special. As soon as my meal tray was cleared, the duty-free service commenced. 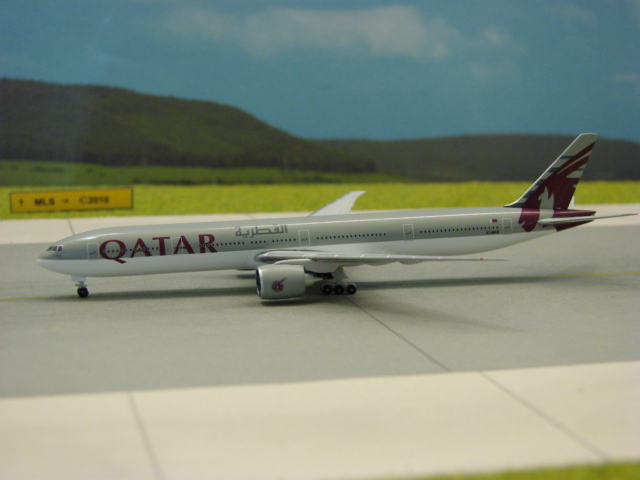 I managed to purchase a Qatar Airways Boeing 777-300/ER Scale 1:500 exclusive model on the flight for US$18 (QR 65). Here are some pictures I took just before landing in Denpasar's Ngurah Rai International Airport. The seat belt sign was turned on at 6.50 p.m., approximately 10 minutes before landing into Denpasar's Ngurah Rai International Airport. Knowing that we were about to arrive in the resort island of Bali very soon, we quickly packed away all our carry-on baggage and buckled up before landing. After a regional flight time of 2 hours 10 minutes from the Republic of Singapore, we finally landed in Ngurah Rai International Airport at 7 o' clock, five minutes ahead of schedule. I originally wanted to take a video of the landing in DPS. However, just shortly before landing, I suddenly fell asleep, before being awoken by my dad. After a few minutes of taxiing, we docked on to our arrival gate, beside a Garuda Indonesia Boeing 747-400 aircraft. Ngurah Rai International Airport is an international airport located in southern Bali, 13 kilometres from Denpasar. The airport was named after I Gusti Ngurah Rai, an Indonesian National Hero who died in the Battle of Margarana on November 20, 1946. It is currently the third-busiest airport in Indonesia, after Jakarta's Soekarno-Hatta International Airport, and Surabaya's Juanda International Airport. It also serves as a major hub for Garuda Indonesia, the flag carrier of the Republic of Indonesia. Overall, Qatar Airways scored 84% between Singapore and Denpasar (Bali). This means they deserve an 'A' grade. It was indeed a good flight with them. As with its motto 'World's 5-star airline', the airline did live up to it. As soon as we had all of our baggage, we disembarked from the aircraft, with the crew bidding us a pleasant stay in Denpasar. We then went to the crowded immigration area, which took approximately 45 minutes, prior to claiming all of our check-in baggage in the baggage claiming hall. As soon as we had all our baggage with us, we went outside to arrange for a transportation system to our resort, The Sentosa Private Villas & Spa Bali. A friendly and dark-skinned gentlemen came to help us with our baggage and take us to our resort. He introduced himself as To Day, and told us that he would be our guide and butler for our 9-day holiday in Bali. We then boarded To Day's van, and we were on our way to The Sentosa Private Villas & Spa Bali. As the roads were pretty crowded, the journey from Ngurah Rai International Airport to The Sentosa Private Villas & Spa took approximately an hour. Here are some pictures I took along the way to our resort. After approximately an hour, we finally arrived at The Sentosa Private Villas & Spas Bali at 8.45 p.m. that evening. We then went to the resort reception counter to check in and receive our villa key. We would be staying in Villa No. 45 for our holiday. After that, we boarded a resort buggy to our villa, arriving at our villa within less than five minutes. After riding the resort buggy, we finally arrived at our Villa No. 45 at around 9 o' clock. When we stepped foot into the villa, it was quite an amazing surprise. I can fully describe the appearance. The villa had three bedroom huts, each equipped with a slightly outdoor bathroom. One of the bedroom huts was disused for the rest of our stay. It also had a pond with koi fish, and a private swimming pool. Most importantly, there was a living room with a kitchen located beside it. After we put all of our baggage into our respective rooms, we went to the living room to set up our electronic chargers. At the same time, my brother and I went to see our hut. Our bathroom was extremely huge. It contained a toilet, a shower, a huge marble bathtub, and two sinks. Our bed was equipped with a white device with teeny tiny holes. This was known as a mosquito net, but ironically, I often call it bed curtains. After checking out our villa, we were finally getting very hungry. We decided to order in-villa dining for dinner. With that, we went to the phone and dialed for the in-villa dining service. We ordered several dishes that may be to our likings. After waiting for approximately 35 minutes, our meals finally arrived at our villa at 9.50 p.m.. We then had a sumptuous dinner that night in the dining room of our main villa. After a sumptuous in-villa dinner, we called the meal service to come and clear our plates as we were finally stuffed to the brim. We then settled back to enjoy the time of our lives by using our electronic devices after setting them up. By the time the clock struck one in the morning, we were all fast asleep in our bedroom huts. This now brings the first section of my summer vacation in the island resort of Denpasar, Bali, Indonesia in June 2011 to a close. Questions or comments are always welcome. The remaining sections will be published as soon as I have selected the pictures which are deemed to be of the best quality.